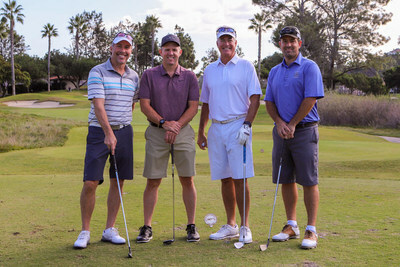 SAN DIEGO, Oct. 29, 2018 /PRNewswire/ -- Bridgepoint Education, Inc. (NYSE: BPI) raised more than $48,000 for Rady Children's Hospital during the Eleventh Annual Bridgepoint Education Golf Invitational. The event was held on Monday, October 15, at the Fairbanks Ranch Country Club in Rancho Santa Fe, Calif. One hundred and two golfers participated in the fundraising event, including representatives from Bridgepoint Education, Ashford University, and community partners. Some 18 organizations served as event sponsors. Since 2010, Bridgepoint has donated more than $400,000 to Rady Children's Hospital through various fundraising events, like the Bridgepoint Education Golf Invitational. "I am immensely proud of the fundraising we have done for Rady Children's hospital as an organization, and especially how individuals step up during this event to support the work Rady's does in caring for sick and injured kids in San Diego," said Andrew Clark, Bridgepoint CEO. Rady Children's Hospital is a 524-bed pediatric care facility and clinical research center in San Diego, providing services to some of the most vulnerable members of the community. It is San Diego County's only hospital dedicated exclusively to pediatric care. In 2018 alone, the hospital has provided care to more than 227,000 children and performed more than 20,000 pediatric surgeries. For more information on Rady Children's Hospital San Diego, visit www.rchsd.org. Bridgepoint Education, Inc. (NYSE:BPI) harnesses the latest technology to reimagine the modern student experience. Bridgepoint owns two academic institutions – Ashford University and University of the Rockies. Together, these programs, technologies, and resources represent a unique model for advancing education in the 21st century. Bridgepoint stands for greater access, social learning, and exposure to leading minds. For more information, visit www.bridgepointeducation.com, www.facebook.com/BridgepointEducation.